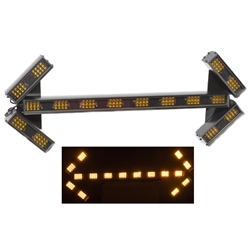 This LED Traffic Assist light bar is designed to direct traffic around a slow moving or stopped vehicle utilizing different sequencing or warning modes. The TA36L-A2 features 16 LED lamp assemblies with 8 lamps in the body and 4 lamps each forming the arrows. There are 16 individual modes. They sequence from side to side in 3 different modes at 2 different speeds. It also has 2 Warning Patterns for advance warning for oncoming traffic. Each High Impact LED is optically enhanced by adding a Lens over the LED. The TA36L-A2 comes with a 25' cable and a Touch Pad controller for simple operation. The TA36L-A2 is designed for interior or exterior applications. This product is made to order. Please allow 7 to 10 business days for factory assembly.